Unique in this form: the city and center are pulling together. This is so in Nürnberg when it comes to conventions – and to the congress city Nürnberg. Together with the city’s Convention and Tourist Office, NürnbergMesse has set up an umbrella brand: NürnbergConvention. This has actively promoted the city as an event destination since the end of 2011. The cooperation concentrates congress activities and offers in North Bavaria’s metropolis. With its many event locations, congress hotels, large Convention Center and unique historical flair, Nürnberg is well equipped for all the requirements of national and international exhibition and congress organizers. “Nürnberg’s variety and good accessibility create a major location advantage for congress organizers. NürnbergConvention ensures that our guests find the best conditions for every event and outside the event too. Travel, accommodation and a coherent supporting programme transform a convention into an experience,” says Sabina Linke, Director International Acquisition and Marketing at NürnbergMesse and NürnbergConvention. As the world’s largest trade fair concern with its own fairground, Messe Frankfurt is present for its customers in more than 150 countries and organised in 2012 more than 100 trade fairs in Frankfurt and worldwide. The company owns the world’s second largest exhibition site boasting 355.000 m² of exhibition space and such prestige locations as the Festhalle, Congress Center, Forum and Portalhaus, the company serves as well as a professional host and partner for exhibitors, visitors and organizers. 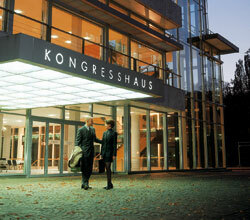 Congress Frankfurt is the department of Messe Frankfurt responsible for managing and implementing congresses or conventions at the fairground. That means a highly professional and dedicated on-site team is working together with congress organisers from the planning to the successful realisation of their events. Congress organisers may choose from a large range of meeting facilities within the fairground of Messe Frankfurt in the vibrant city of Frankfurt. With an array of stylish buildings that can be combined and configured in countless ways, supported by a state-of-the-art infrastructure, Messe Frankfurt is able to fulfil the most ambitious and sophisticated requirements. Whilst the venerable Festhalle can look back on a hundred years of history and seduces visitors with its dignified elegance and charm, the Congress Center and Forum are paradigms of architectural ingenuity, of transparency and light, of technological refinement. There are a total of 80 congress and conference rooms with a capacity for 22,000 people, as well as spacious exhibition areas. As of 2014, this will be supplemented by the Kap Europa congress building in the adjacent Europaviertel district. The congress centre Kap Europa will offer 7,700 sqm of space, including a hall large enough for 1,000 people, a divisible room for 600 people and 12 additional conference rooms, with space for a total of 2,400 guests. The spacious foyers, filled with abundant natural light and set over five levels, feature spectacular views of Frankfurt and the neighbouring Skyline Plaza shopping centre. Both the construction and operation of this new structure meet strict sustainable standards. In October 2012 – long before the construction project was even completed – the Kap Europa received a certificate in gold from the German Sustainable Building Council (DGNB) for its high environmental standards. This is the first event building that has ever received this sort of certification. And all this, right in the middle of downtown Frankfurt! The central location makes it a breeze to reach. The congress facilities of Messe Frankfurt are only 15 minutes by taxi from one of the worldwide largest airport, where 107 airlines annually fly more than 55 million passengers to 275 destinations in 111 countries. Furthermore, Germany’s busiest railway station is within walking distance of the exhibition grounds. Together with the Frankfurt motorway junction, the locations on the fairground can be easily reached from anywhere in the world. Another advantage of this international venue is Frankfurt’s extensive hotel capacity – perfect for delegates attending longer events. 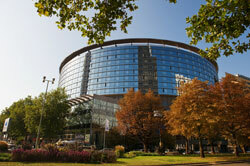 The four-star Maritim Hotel is directly linked to the Congress Center and offers over 500 rooms. Visitors can choose from over 5,700 hotel rooms within walking distance of the Messe Frankfurt exhibition grounds, which can enormously reduce the need for shuttle services. Messe Frankfurt is to boost its capacity in the congress segment by building Kap Europa. 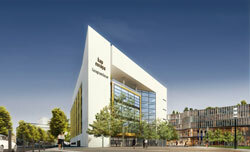 With its new location, Messe Frankfurt is creating a highlight in Frankfurt’s Europaviertel district. A new lightness in meetings from 2014. Across five levels, the Kap Europa offers freedom of space for all occasions. The Horizont hall has capacity for 1,000 people and the Meridian hall, which can also be divided, capacity for up to 600. Thanks to their imposing ceiling heights, both halls appear particularly spacious and open. The 14 meeting and conference rooms can be flexibly used and fulfil all requirements whilst the light flooded and spacious foyers impress with spectacular views of Frankfurt’s skyline and the neighboring shopping centre Skyline Plaza. Kap Europa with its striking angular design, is a solid steel concrete construction which ascends 33 metres into the sky. What offers an imposing appearance on the outside, provides an intelligent concept on the inside: 7,700 m² event space across 14 conference rooms. In addition, 4,200 m² foyers offer plenty of natural daylight and many individual possibilities across five levels. Frankfurt am Main, conveniently situated in the heart of Germany, is one of the world’s busiest traffic and transport hubs. Its airport ranks amongst the largest in Europe and is only 11 minutes from the city centre by train. 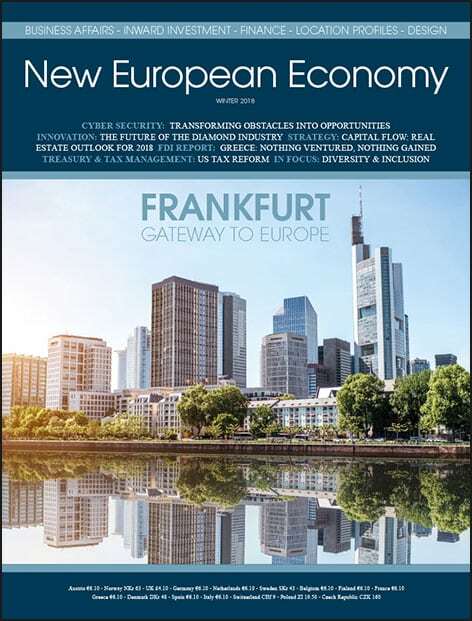 Known as the "Gateway to Europe“, Frankfurt is the ideal destination for international congresses requiring highest possible standards. Approximately 64,000 conferences and congresses are held in Frankfurt every year, nearly a quarter of which are internationally oriented. Not surprising, really, with Frankfurt offering its guests such a variety of congress venues and fringe programme opportunities. Frankfurt has a wide range of modern conference facilities to choose from, headed by the multifunctional congress facilities of Messe Frankfurt, the city’s famous fair and exhibition centre. Frankfurt’s hotel industry is equally extensive, with nearly 40,000 beds available in accommodation establishments of every category. Better still, they are located throughout the entire city and its environs while being easily accessible by all means of transport. 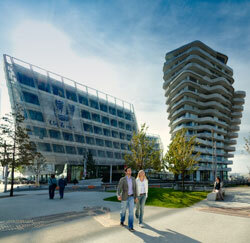 A further advantage is the close proximity of Frankfurt’s downtown locations. It takes as little as half an hour to traverse the city centre on foot. More than 7,000 hotel rooms are available within a one-mile radius of the Congress Center Messe Frankfurt and the Frankfurt fairgrounds. The Main metropolis also features an excellent selection of unusual event venues, a rich cultural life and scenic surroundings. The greater Frankfurt Rhine-Main region has plenty of fringe programme possibilities on offer as well. How about a theatrical showing of Swan Lake? Or do you prefer experimental dance theatre? Philharmonic sounds or hard rock, perhaps? 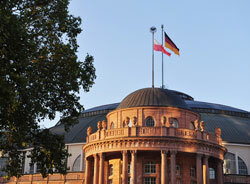 What about art extraordinaire at the Städel Museum or international variety theatre in the backstreets of Frankfurt? Or how about team-building and outdoor activities? One thing is certain, the cultural diversity of Frankfurt Rhine-Main has something for every taste. Four major opera houses, 15 theatres and over 100 museums combine to offer your event participants entertainment of the highest order. The Frankfurt Convention Bureau is your experienced partner for all matters regarding conventions, meetings and incentives in Frankfurt. Special room allotments for your congresses as well as overnight accommodation for all participants can be booked quickly, easily and at no charge through our congress department, along with many other services available for meeting your requirements. It started at a small kitchen sink in a small suburb in Bonn with a sack full of sugar and a copper kettle. It has developed into one of the best-loved and most well-known brands in the confectionery industry. This is the story of German company Haribo, a global giant that employs over 6,000 staff worldwide, 550 of them in the U.K. 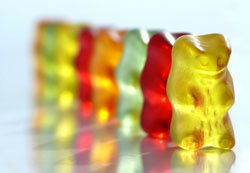 If all the Haribo gummy bears produced in a year were laid down head to toe, they would go around the earth four times. The Haribo story is one of product innovation, effective advertising, bold acquisition and fierce brand protection. Is Hamburg an option for your next event? Events at the waterfront In a major media centre like Hamburg, the red carpet is occasionally rolled out. Small wonder, since the city offers endless possibilities for celebrations, meetings and events. Those who are looking for the unusual can find it here: floating lounges on or above the water, generous ballrooms, animal backdrops in the aquarium, historic portside sheds, turn-of-the-century industrial architecture and ships of any size. Often, these places are not only located at the scenic waterfront, but have their own piers and can be reached by boat. No doubt: Hamburg is a cosmopolitan city. Not only the centuries-old trade relations and its importance as consular city are evidence of this, but above all its flair of openness and tolerance. By offering a unique array of meeting facilities and event locations ranging from the highly modern to the very traditional, Baden-Baden – the world-famous spa resort in the Black Forest – is the ideal destination for hosting your conventions, incentives and product placements. With its beautiful and breathtaking natural surrounds and relaxing atmosphere, the former “Summer Residence of Europe” looks forward to playing its part in your success story.